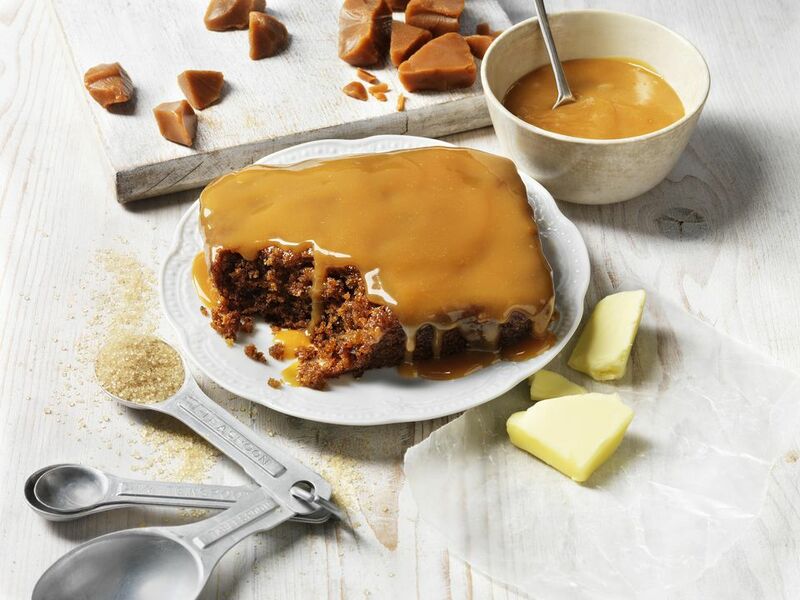 Sticky toffee pudding is one of Britain's most loved puddings. The dark, rich, date-filled sponge, drenched in thick toffee sauce is not for the faint-hearted, it is a deep, very sweet pudding - delicious. I recommend making the puddings a few days in advance and soaking in the sauce as described at the end of the recipe if you want a really sticky experience. Serve the pudding with ice-cream or a good dollop of custard sauce. Any wonder it is one of Harry Potter's favorite puddings. Butter 6 (200 ml) individual pudding tins or use an 8-by-8-by-2 1/2-inch square baking dish and dust lightly with flour. Put the chopped dates into a large glass bowl, cover with boiling water, leave for 20 minutes to swell and soften. Once soft, add the vanilla extract. Sieve the flour and bicarbonate of soda into a large baking bowl. In another baking bowl, cream the butter and sugar together until light and creamy, don't worry about grains of sugar, they will melt during cooking. Little by little, add the beaten eggs, mixing really well between additions. Add the treacle and beat well. Using a large metal spoon carefully fold in one-third of the flour, then carefully stir in one-third of the milk. Repeat until all the flour and milk is used up. Add the chopped dates (including any liquid in the bowl) and stir gently. The pudding mixture will resemble a thick batter. Divide the mixture between the six pudding tins and place on a baking sheet. Bake in the preheated oven for 20 to 25 minutes for individual puddings or 45 to 50 minutes for the large square. The cake should be raised and firm to the touch. If not, cook a little longer, but take care not to burn. Once ready, remove from the oven and leave to cool in the tins for 10 minutes before turning out. Over a medium heat, melt the butter, sugar and half the cream in a saucepan. Raise the heat slightly and bring to the boil stirring constantly until all the sugar has dissolved. Add the treacle and allow the sauce to bubble for 2 minutes. Remove from the heat and leave to cool for 1 minute then stir in the remaining cream. Place a portion of the cake onto warm individual serving dishes, and drizzle generous amounts of sauce over. The puddings can be made a day or two in advance, placed in an ovenproof dish and drenched with the sauce. Cover the dish loosely with aluminum foil and store until needed. Reheat for 20 minutes in a hot oven, 160C/325F/Gas 3, or until the sauce is bubbling nicely. Serve with custard or ice cream. The puddings drenched in the sauce also freeze well. Reheat as above.